When updating your iPad or iPhone be careful with a possible issue involving driver updates with Windows 7. 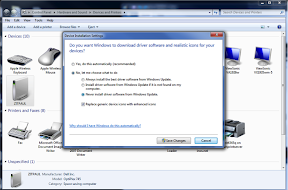 By default Windows 7 will look for driver updates automatically when connecting a new device. While it is searching for the drivers it will temporarily disconnect the device. If you are updating your iPhone OS or iPad disconnecting the device at that start of the upgrade can corrupt the software update and leave your iPhone or iPad in a state requiring it to be reconnected to iTunes and restored. If you connect your iOS device frequently to your computer and backup your settings, apps, music, videos, books, etc., you should be fine. When the computer restores it will restore the backup it does right before the installation runs. If however you are upgrading from a computer you don’t backup your device on or for some reason your App syncing isn’t turned on you could lose data. To make sure WIndows 7 doesn’t disconnect your iOS device during the upgrade follow the steps I have listed below. 3.) Then select No, let me choose what to do. Select Never install driver software from Windows Update and select save changes. This will keep WIndows 7 from disconnecting your USB devices and looking for new drivers when you plug them in. The easier option is of course to use a Mac and it won’t disconnect your device while looking for new drivers. If however you are upgrading from a computer you don’t backup your device on or for some reason your App syncing isn’t turned on you could lose data. Can anyone advise me on how to update my drivers on my windows 7 pc so I can connect with the ipad bluetooth? There is no way to connect via Bluetooth to Windows 7 with your iPad you can however do wireless syncing out with the latest version of iOS and the latest iTunes.